Updated 11.01.2018: We first published how to plan a Glacier National Park winter trip on 2.27.2016. 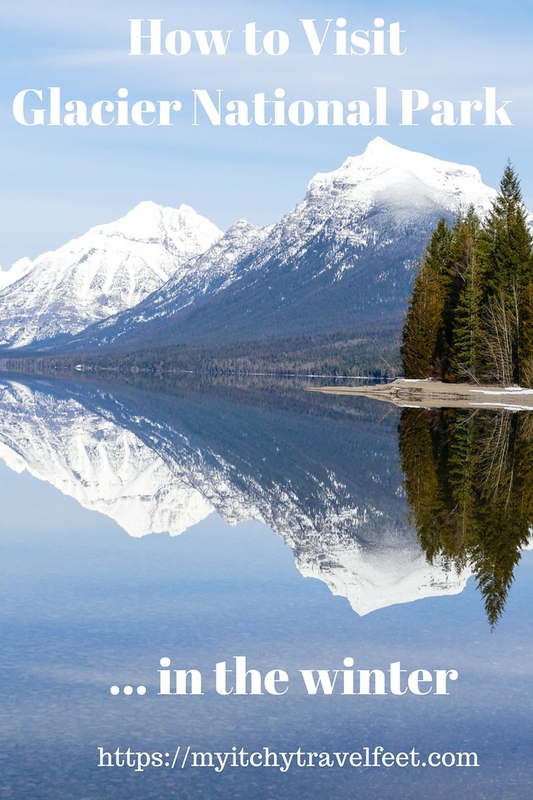 Each year, we update it with the latest information about where to stay and what to do in this gorgeous national park in Montana. So bookmark this page or subscribe to the My Itchy Travel Feet Weekly Broadcast so you’ll be the first to know! 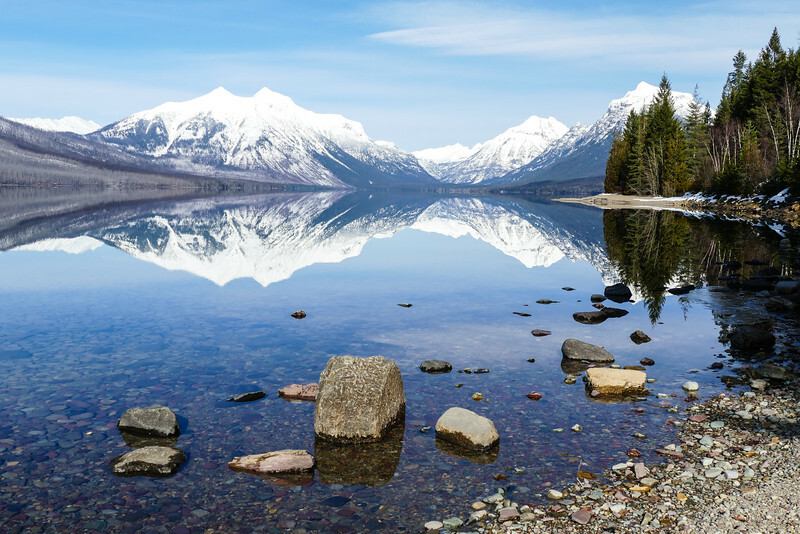 Do you enjoy visiting Glacier National Park but hate the summer crowds? Alan and I do, too. Of course you’ve probably read the advice to arrive in the early fall, once families have returned home to start the school year. But have you thought about a Glacier National Park winter trip? It’s a fine time to visit this lovely corner of Montana. And you’ll practically have the place to yourself. 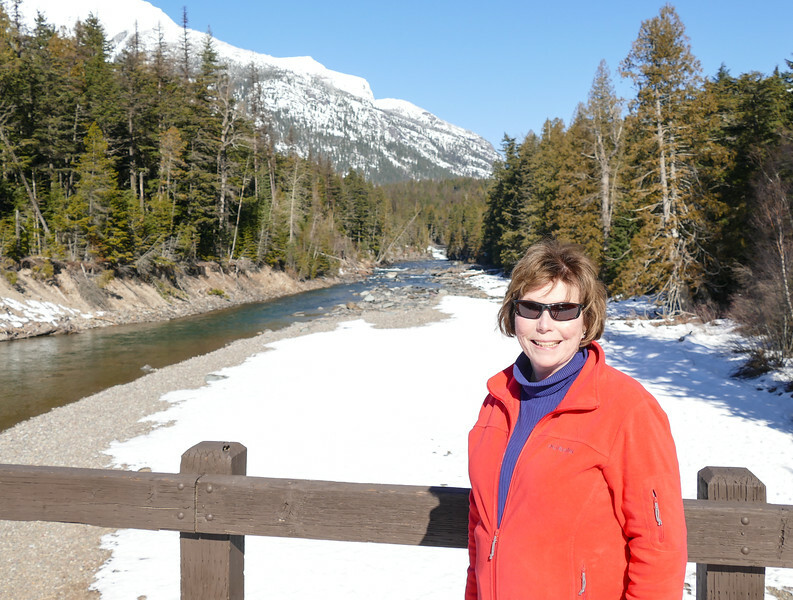 On a recent Montana winter vacation to Glacier National Park, Alan and I discovered a frozen wonderland devoid of people. Of course visiting national parks in winter—when they’re mostly closed—involves a bit of travel planning, so follow our advice for an active winter adventure that will satisfy your itchy travel feet. Look what you’ll see on a Glacier National Park winter trip. 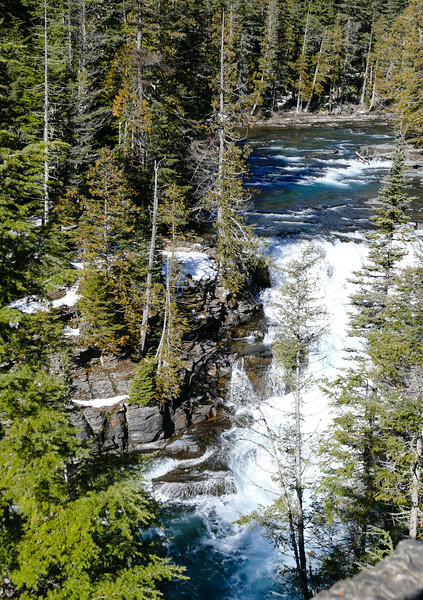 A winter vacation in Glacier National Park is all about outdoor activities, especially snowshoeing and cross-country skiing—snow hiking is also a possibility. We recommend having firm lodging reservations in place before leaving home. Spontaneous travel is fun but it can get you in trouble when traveling to off-season destinations in cold climates like Montana. When Alan and I began planning our trip, we started at the source—the National Park Service’s official Glacier National Park page for winter trip planning. Plus we downloaded this pdf for reference, as cell phone service in the area is spotty. With two exceptions, all of the facilities in the park are closed. The West Glacier Headquarters building is staffed during the week while the Apgar Visitor Center is open on Saturdays and Sundays. McDonald Falls tumbles down the river. During our late February trip, the park was experiencing a mild spell, which meant excellent road conditions and moderate temperatures (high 20’s to 40’s). But weather conditions in Glacier National Park are extremely changeable. That’s why we were constantly checking the National Weather Service report for West Glacier and monitoring Montana road conditions. In winter, Going to the Sun Road belongs to cross-country skiers and snowshoers. All of the Glacier National Park lodges and most West Glacier accommodations close down for the winter, which is why we highly recommend making reservations before arriving. The historic Belton Chalet is closest to the west entrance of Glacier. Although lodge rooms aren’t available in the winter—the restaurant is open on some weekends—Belton Chalet offers cottage rentals. Historic Tamarack Lodge and Cabins is another nearby option. And the communities of Columbia Falls (22 miles), Kalispell (34 miles) and Whitefish (26 miles) are also good places to stay during the winter months. On our trip, we chose Izaak Walton Inn, Essex, Montana (27 miles), for its historical ambiance, excellent restaurant and on-site cross-country skiing and snowshoe trails. Built in the late 1930’s to house Great Northern Railroad personnel—and later to be used as a resort for an entrance to Glacier National Park that never materialized—the rooms are adequate but not luxurious, however they do come with private baths and a ton of history. For more unique lodging, consider reserving one of the luxury railroad cars or cabooses. That’s our choice for next time. Every inch of wall space at Izaak Walton is filled with railroad and Western memorabilia. Alan and I enjoyed sipping wine by the fireplace in the lobby area each evening (and trading stories with other guests) before heading into dinner at the Dining Car Restaurant. The generously portioned food is excellent, especially considering the inn’s remote location. At Izaak Walton Inn, you’ll find groomed trails for every level of cross-country skiing or snowshoeing plus equipment rentals and lessons. The Essex area is known for its prolific snows, which means a long ski season. If the roads are hazardous, you’ll still find plenty to do without having to drive anywhere. Accommodation rates include a pass for the trails. 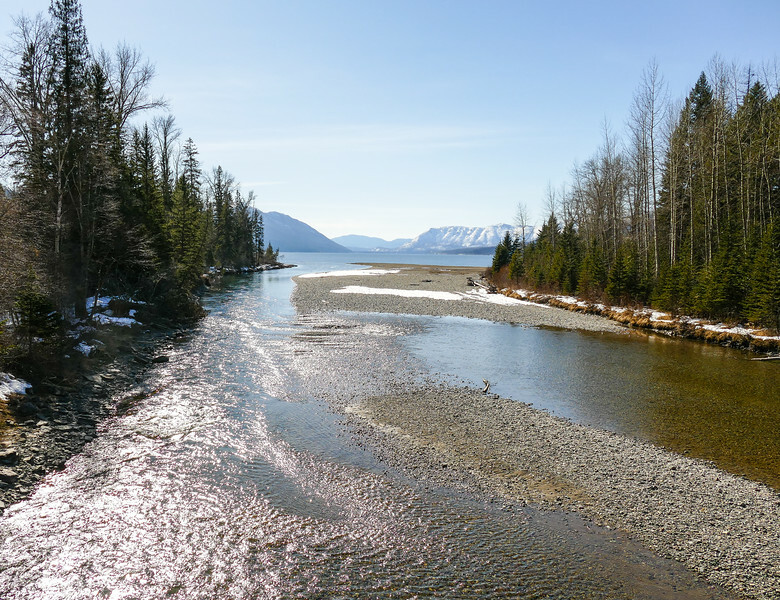 If you’re daytripping in Glacier National Park, order a picnic lunch before leaving Izaak Walton, or plan for a late afternoon lunch at Glacier Grill and Pizza in West Glacier. That’s what we did. Be sure to pack water and snacks for a winter outing in Glacier National Park as all services are closed. Going to the Sun Road views get better and better. 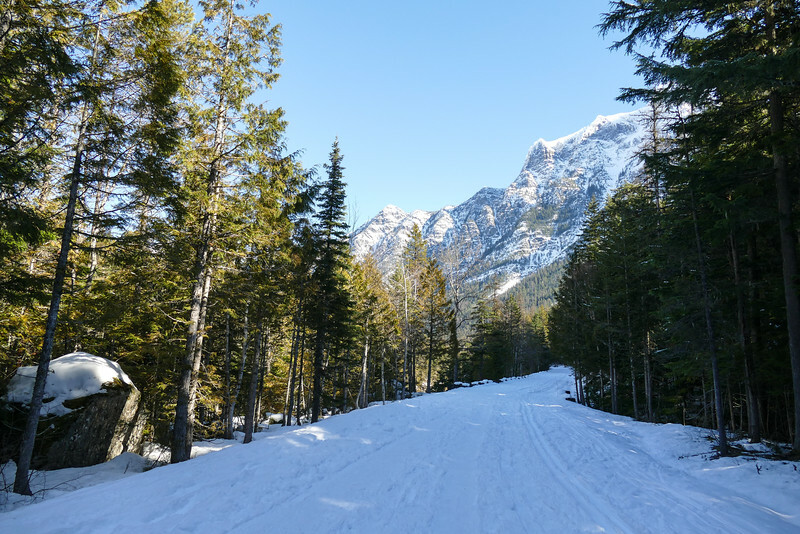 Although snowmobiles aren’t allowed in Glacier National Park, you’ll find plenty of cross-country skiing and snowshoeing trails. During our mid-week visit, Going to the Sun Road was cleared to the gate at Lake McDonald Lodge. After parking in the lot, Alan and I hiked on a four-mile round trip along the unplowed portion of Going-to-the-Sun Road. The snow was packed down enough that snowshoes were not necessary, although I used hiking poles for stability. In sunny areas, the snow became quite slick. What about wildlife? While grizzly bears will be hibernating, a snowy landscape makes it easier to spot elk, deer and moose. 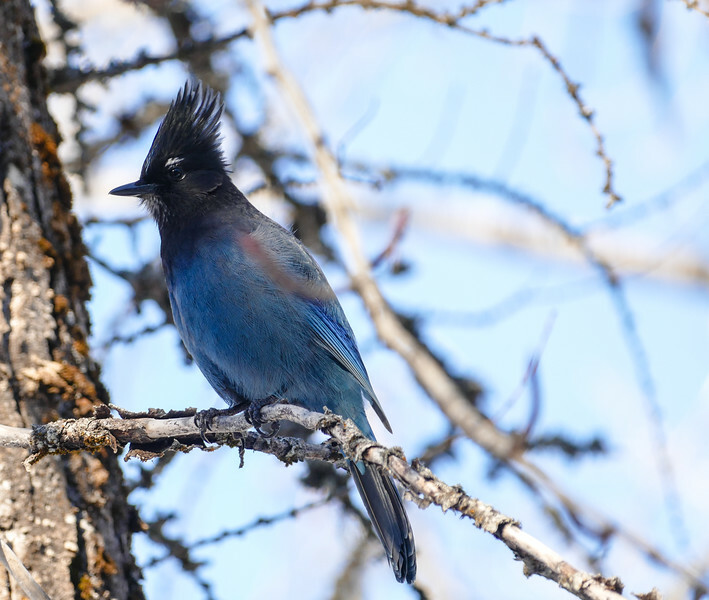 Birdlife includes harlequin ducks, white-tailed ptarmigans and even stellar jays. Although we saw a few other hardy souls, it felt as if Alan and I had the park to ourselves. Trees crowded in on both sides of the road with an occasional mountaintop peaking up through the distance. A Glacier National Park snowshoe experience is a quiet, peaceful journey through nature that we hope to repeat. 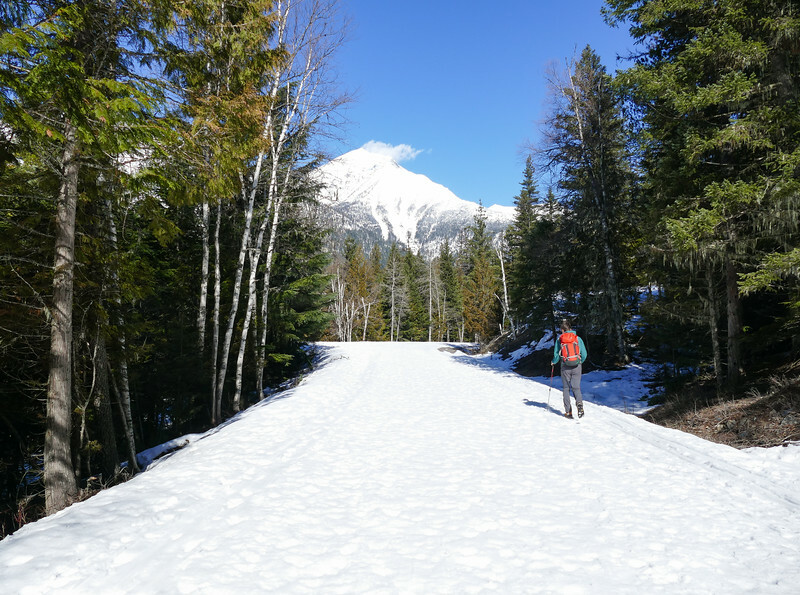 If you’re looking for free Glacier National Park winter tours, rangers lead two-hour snowshoe walks from the Apgar Visitor Center on the weekends. The walks are free and rentals are available for those who don’t have snowshoes. It’s fun photographing the reflections in McDonald Lake. Don’t forget your cameras. If there is no wind and the day is sunny, reflections in McDonald Lake offer amazing photographic opportunities. Look for pullouts with obvious paths leading down to the sandy shores of the lake. 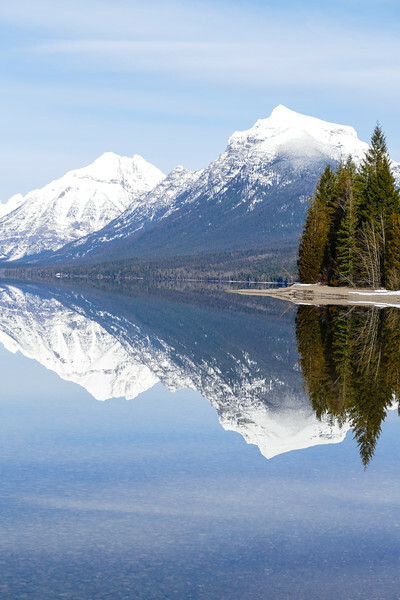 You’ll return home with Glacier National Park winter photos to amaze your family and friends. Many of our photos from that day ended up in Coloring Glacier National Park, A Grayscale Coloring Book for Travelers. Layered clothing is the best approach for a winter day in Glacier National Park. And don’t forget to wear sunscreen! On our visit, cold weather wasn’t that much of a factor, although it certainly can be. I was comfortable wearing a merino wool base layer under safari pants. Up top, I wore a merino wool base layer, long sleeve turtleneck and fleece jacket. I started out with a neck warmer and hat as well but soon became warm and off came the jacket, neck warmer and hat. Alan and I both appreciated the hand and toe warmers we had tucked into our gloves and hiking boots. If you live in a warm weather climate and only take the occasional winter trip, my advice for cold weather gear for women that packs light will help. And here’s the version for men. We lucked out with mild weather. You may not. Frigid temperatures and lots of snow are the norm, and the weather changes quickly. Always be prepared with extra layers of clothing in your backpack. Looking from the McDonald Bridge toward McDonald Lake. Alan and I are fortunate that Glacier National Park is a simple 4-hour road trip from our Montana home. But most people aren’t that lucky. Why not let Amtrak do the driving for you? Board the Amtrak Empire Builder in Seattle, Chicago or Minneapolis for a scenic journey to Izaak Walton Inn in Essex—yes the train stops here. You’ll be all set with comfortable accommodations, great food and plenty to do. Glacier National Park guided snowshoe and cross-country skiing tours can be booked from Izaak Walton. Or reserve a rental car ahead of time. It will be waiting for you at the Inn. Will you be visiting Glacier National Park in winter? Join the conversation at the My Itchy Travel Feet page on Facebook or send us an email to ask a question.